DW0050 is an electronic module which makes use of ultrasound technology in order to recognise the presence of a surface by measuring the distance up to some tens of centimeters. The module DW0050 is a digital sensor designed to maximise the sensitivity. It is able to detect small objects also. Moreover, it is recommended to compose a system using multiple modules DW0050 sharing a wired interface based on a digital serial bus. In doing so, the modules will cooperate in order to detect the presence of objects (see DW0050 detector application note). The interface present on each module consists of two 5-pin molex connectors 180°. A connector connects the module with the MASTER board that receives the signal detection of the obstacle. The other connector, with the same pin-out, can be used to connect another module DW0050. Thus more modules can be connected in cascade which can collaborate in identifying the presence of obstacles. When the detection pin is driven to a low logic level means that an obstacle has been detected. 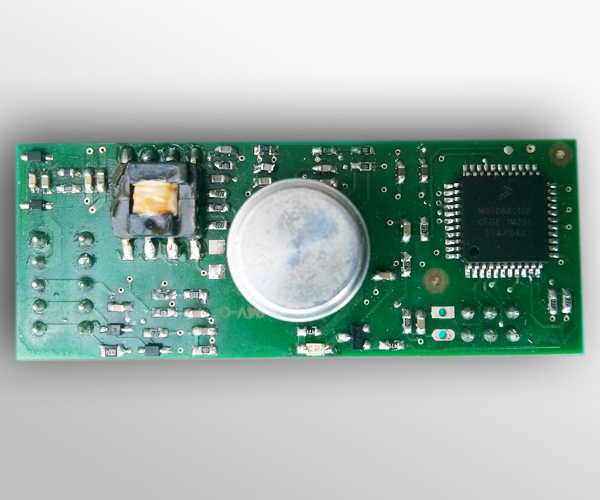 This same pin can be used as a LIN bus full duplex communication for a more complex interaction between the MASTER board and the module DW0050. To use the LIN bus is needed to 1kΩ pullup. The MASTER board can drive an optional trigger signal to start the measurement. To be considered valid, the trigger signal should be active for at least 250us while the minimum period of measurement is 30ms. The measure that leads to the identification or not of an obstacle in the cone of coverage of the sensor is made ​​by transmitting a burst of ultrasound and measuring the amount of reflected energy, from any obstacle, which go back to the sensor. The DW0050 module supports two modes: “thru-beam” and “single reflective sensor (SSR).” For each trigger signal, when used, is made a single measure. A signal FLAG is activated if three consecutive measurements indicate the presence of an obstacle. The DW0050 module also implements a calibration algorithm to exploit the ultrasonic sensor / transmitter. Thanks to this type of devices the sensor can be used in environments with high electromagnetic noise. On road barriers detecting the presence of an obstacle. Detection distance can be changed using a on module dip switch.